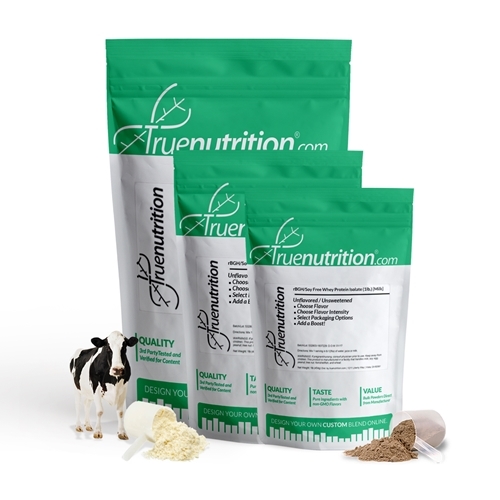 True Nutrition's rBGH/Soy Free Whey Protein Isolate is sourced from cows that are not administered hormones or antibiotics, and which are pasture-raised in the USA when weather permits. The material is also entirely soy-free, using sunflower lecithin in place of the traditional soy lecithin to allow for increased mixibility. RBGH/Soy Free Whey Protein Isolate is processed using cold-water microfiltration, and provides 27g of protein to help support muscle-building! Taste: Light, milky taste that goes great with any flavor! Whey Protein Isolate (Milk), Lecithin (Sunflower). TrueFlavors: Flavoring (Natural Flavoring Extracts, non-GMO Tapioca Maltodextrin, Gum Acacia, Stevia). May also contain: Cocoa Powder, Guar Gum. Natural Flavoring: Flavoring (Natural Flavoring and Coloring, Stevia, Maltodextrin). May also contain: Cocoa Powder. Other Flavoring: Flavoring (Natural and Artificial Flavoring and Coloring, Acesulfame Potassium, Sucralose, Modified Food Starch, Silicon Dioxide, Maltodextrin). May also contain: Cocoa Powder, Guar Gum. The latest chocolate formula is perfect. Its so smooth and tastes great. You guys have done an excellent job! P.s. if you read the description it statesthat this is the cold filtration isolate. I really appreciated all the reviews when I was placing my order, so I wanted to leave one too. It seemed like everyone raved about the Chocolate Fudge Brownie flavor, so I tried that and went out on a limb and tried Chocolate Peanut Butter Cup as well. I also ordered 2 flavors of Oat Powder to mix them with. I ordered the Vanilla Cake Batter and Coconut. BY FAR, the Chocolate Peanut Butter Cup and Coconut combination was THE BEST!!! The other chocolate one was decent, but this combo was AMAZING! Like I would order it at a milkshake place and devour it with gusto. Do yourself a favor and try chocolate peanut butter cup and coconut. YUM! I also bought some Udo's Omega Oil Blend to add to it to make it more filling. One scoop each whey and oat powder and 1/2 tbsp oil works for me as a meal replacement. Yum. Order and enjoy! really liked choc peanut butter cup and java mocha. Not a fan of regular coconut. True nutrition delivered quick, the reason I gave it 5 stars is because someone in my neighborhood thought this protein was so good, they decided to take the delivery from my door step before I got home. I ordered cake batter and strawberry, so when I see a guy who looks a bit more buff soon I will ask that individual how it tastes since I have to make another order. Seriously tn products are great, just start doing sig service, I will request it in the future. I agree with Yaw's review. I have been buying TN protein for about 6 months and it always mixed down very well. The last batch I just ordered has a very gritty, sandy feel to it. Even after adding extra water or milk it just doesn't mix the same way. The flavor is still great but it's hard to get over that gritty feel of it. I have been buying TN for about a year or so now, and the products are quality. I really loved the whey isolate as it mixed down super easy. It seems they have changed their formula or powder creation process, as now it is very gritty. Almost has a sandy mouth feel. The taste is still excellent and I'm sure the quality of the protein hasn't changed, but I would gladly pay an extra $1-2/lb to get that extra level of granularity. Makes a huge difference. I have searched and searched for the perfect protein over the years and the search finally ended once I found this protein. I don't do well with milk products but this protein has yet to give me any issues. Chocolate fudge brownie is amazing, I am scared to try any other flavor because I love it that much. Not only is it great to drink but I use it in my pancakes all the time, yes chocolate banana pancakes WOO! I don't usually write reviews for items, but this is the exception. If you were me and were on the edge about trying TrueNutrition, don't be, I got your back. The protein is awesome, but the Natural Orange Cream flavor IS NOT the same as the orange creamsicle flavor everyone is raving about in their reviews. It tastes like watery orange drink with a sickeningly strong liquorice aftertaste from the stevia. The True flavor Chocolate Brownie is awesome, even with a touch of stevia aftertaste.